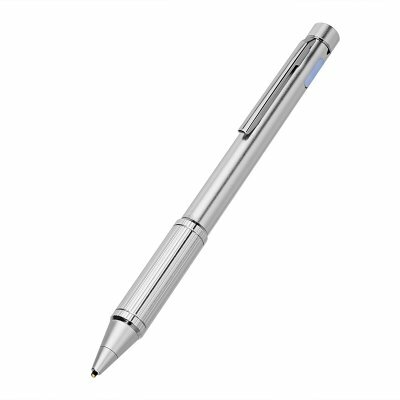 Successfully Added Active Capacitive Pen - 8 Hours Work Time, LED Power Indicator, 1.5mm NIB, Automatic Shutdown (Silver) to your Shopping Cart. Built-in rechargeable battery brings up to 8 hours of normal usage time. If you are tired of using your miniature on-screen keyboard to make notes on your smartphone or tablet, this active capacitive pen is the perfect electronic gadget for you. Featuring a narrow 1.5mm nib, this stylus pen allows you to make notes, sign documents, and draw on your smartphone or tablet like never before. With its stylish design, this gadget can be used with confidence at any occasion. Whether you’re making notes during a business meeting or are working on your next art project for school, with this touch pen your possibilities will be endless. The pen itself comes with a smooth and slim body, guaranteeing a comfortable and stable fit no matter the size of your hand. Making notes and signing electronic documents has never been easier and your electronic art has never looked better with this highly accurate stylus pen. Near to the top of this stylish touch pen, you will be able to find an integrated LED light that indicates your current battery status. With its built-in 140mAh battery, this stylus pen brings along a stunning 8 hours of usage time, allowing you to write plenty of notes and finish numerous drawings without needing to worry about battery life. The pen furthermore comes with an automatic shut down features thanks to which it will power off automatically when not in use – guaranteeing that it won't drain any battery once you’ve put your pen aside. This active capacitive pen comes with a 12 months warranty, brought to you by the leader in electronic devices as well as wholesale electronic gadgets..
Arabic: - القلم الإلكتروني نشط - Chinese Simplified: - 积极的手写笔 - Czech: - Aktivní Stylus pero - Danish: - Aktive Stylus Pen - Dutch: - Actieve Stylus Pen - French: - Stylet actif - German: - Aktiven Stylus-Stift - Hebrew: - העט פעיל - Hindi: - सक्रिय स्टाइलस पेन - Italian: - Penna stilo attivo - Japanese: - アクティブなスタイラス ペン - Korean: - 활성 스타일러스 펜 - Malay: - Pen Stylus aktif - Norwegian Bokmål: - Aktive skrivespissen - Romanian: - Active Stylus Pen - Russian: - Активный стилус - Spanish: - Lápiz óptico activo - Thai: - ปากกา Stylus ที่ใช้งานอยู่ - Turkish: - Etkin Stylus kalem - Vietnamese: - Cây bút Stylus hoạt động.